With all of the fun things to do on the island of Ambergris Caye, it might sound crazy to leave. However, there are some incredible expeditions and adventures that you can enjoy once you depart from the island. If your kind of fun involves exploring uninhabited islands, snorkeling, swimming, private romantic cruises or deep-sea fishing, then be sure to head to the Exotic Caye Beach Resort's Pier and Marina. Conveniently located within walking distance of the hotel and the Grand Baymen properties, this pier is the place for boat trips and charters of all kinds. Here are some of the top adventures you can enjoy right from the pier. If you want to head to Mexico for a few hours, you can do so thanks to the direct boat service that travels from the pier to the town of Chetumal, Mexico. Chetumal is home to incredible attractions, and it can be fun to see a whole new country on your vacation. Be sure to check out the traditional fishing village called Calderitas, the Museum of Mayan Culture and the Mayan archaeological site of Oxtankah. If you have time, walk the Boulevard BahÃ­a that runs along the coast and admire the beautiful views of the coastline. Ambergris Caye is a great destination for anglers, and some of the most fun can be had on deep-sea fishing expeditions. Staff at the Exotic Caye or the Grand Baymen can recommend local boats and guides, and most charters will include all the fishing equipment you need to hook snapper, grouper and even marlin. With amazing coral reefs and impressive underwater marine life, it makes sense to try snorkeling or scuba diving at least once during your stay in Ambergris Caye. Rather than staying close to the shoreline, book a charter and travel to spectacular spots like the Hol Chan Marine Preserve or Shark-Ray Alley. Although there are countless spots on the island where you can enjoy a secluded moment with a loved one, there is something especially romantic about being on the water. Hire a private charter in Ambergris Caye from the pier to bring you along the coast, enjoy the sunset or have a romantic picnic on a secluded nearby beach. 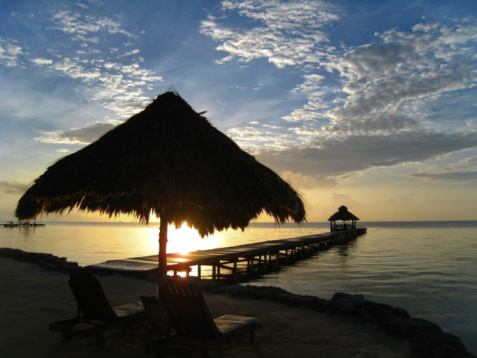 Using the Ambergris Caye Resort Pier and Marina is a smart way to make the most of your trip. Click here to read more about the fun excursions you can take from the area.